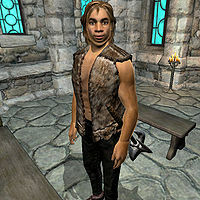 Natch Pinder is an Imperial pauper residing in the inhospitable settlement of Hackdirt, south of Chorrol. Like the other inhabitants, he is a devout worshipper of The Deep Ones and is partly responsible for the disappearance and planned blood-sacrifice of Seed-Neeus’ daughter Dar-Ma. Like the other cultists in Hackdirt, Natch can often be found patrolling the outside areas, making sure that no strangers arrive without being given a proper warning. He can be found wandering amidst the burned-down ruins every day from 6am to 8pm, every once in a while breaking off to pay short one-hour visits to a few destinations around town: at 8am, he visits Moslin's Inn, at 1pm, he enters Moslin's Dry Goods, and at 7pm, he finally enters his own house for one hour of wandering. At 8pm, he leaves his house and enters the Chapel of the Brethren, where he listens to Etira Moslin reciting the obscure text Bible of the Deep Ones. At 1am, all the cultists rise from their benches and enter the Hackdirt Caverns. Down there, the Hackdirt Brethren awaits and they all spend five hours worshipping the Deep Ones before going their separate ways at 6am. He wields an iron mace and wears a set of typical lower-class attire, a pair of blacksmith's pants, a huntsman vest and stitched leather shoes. He carries a small amount of gold. When you are detected by one of the Hackdirt citizens, Natch will follow you from a distance, making sure you leave town. If you fast-travel, Natch will travel with you but will immediately return to Hackdirt. Esta página foi modificada pela última vez à(s) 19h09min de 28 de dezembro de 2015.